With a creamy mayo-steak sauce spread, grilled onions, and two kinds of cheese, these sandwiches are the best variation on a patty melt I've ever tried. Dovetailig tip: Use the the leftover pot roast from day 2. Re-heat the pot roast in the microwave. Butter one side of all 8 slices of bread. Melt 3 tablespoons of butter in a large skillet. Add onions and cook over medium heat, stirring frequently, until onions are soft and golden brown. Combine the sauce ingredients in a medium bowl. Heat a griddle over medium-high heat. Spread a layer of the sauce on the unbuttered side of 4 slices of bread. Top with a piece of cheddar cheese. 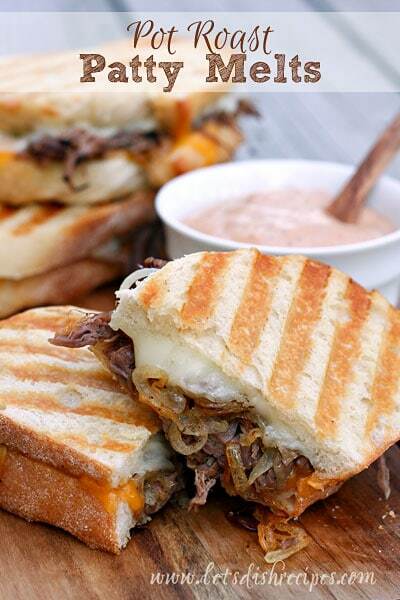 Top each slice of cheddar with about 1/2 cup of pot roast, a generous portion of onions, and the slice of Provolone cheese. Top with the remaining slice of bread, buttered side out. Grill, flipping once, until both sides are browned and crispy. Serve patty melts with the remaining sauce, for dipping.